This is a new serial that started on the Feburary issue of the monthly manga magazine, Shonen Ace. Angelic Layer is a fighting game type of manga. 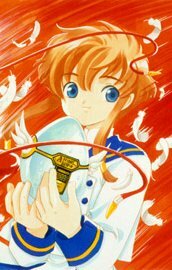 It is about a 13 year old girl name Suzubara Misaki who is the controller of Angelic Layer. This is all I know about this new series.